The quickest way to upload files/folders, create tasks, add posts/polls, create workspaces, events or add users. 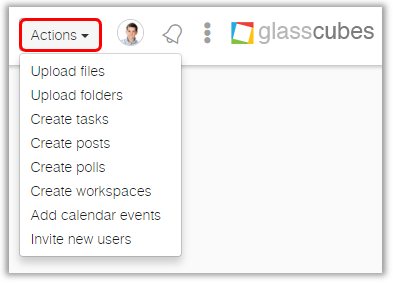 The quickest way to add items to Glasscubes is using the ‘Actions’ button, which is located on the right hand side of your top navigation bar. Click on the button and a drop down menu will appear. The options that appear will depend on the permission settings you have been assigned.